••• Photo by William Thomas Caine/Getty Images. The U.S. national debt is more than $22 trillion. It's greater than the economic output of the entire country. It occurred despite Congressional attempts to cut government spending. These included threats to not raise the debt ceiling and the U.S. debt crisis in 2011. That's when the United States headed toward a debt default. It continued with the fiscal cliff crisis in 2012 and a government shutdown in 2013. Sequestration slowed, but didn't halt, deficit spending beginning in 2013. You can't look at a country's national debt in isolation. Sometimes expansionary fiscal policy, such as spending and tax cuts, was needed to spur the economy out of recession. Other times, the United States increased military spending to respond to national threats. For those reasons, the national debt by year should be compared to the size of the economy as measured by the gross domestic product. This gives you the debt-to-GDP ratio. You can use it to compare the national debt to other countries. It also gives you an idea of how likely the country is to pay its debt back. 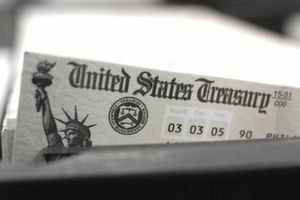 The government creates debt with either excessive spending or deep tax cuts. If this expansionary fiscal policy boosts growth, it can begin to lower the debt. A growing economy will produce more tax revenues to pay back the debt. The theory of supply-side economics says the growth will be enough to replace the tax revenue lost. But that only occurs if taxes are too high, say above 50% of income. There are other events that can increase the national debt. For example, the U.S. debt grew after the 9/11 attacks as the country increased military spending to launch the War on Terror. Between fiscal year 2001 and Y 2001-FY 2020, it cost $2.4 trillion. This included increases to the Department of Defense and the Veterans Administration. In the table below, the U.S. debt by year is compared to GDP and national events since 1929. Please note that the debt and GDP are given as of the end of the third quarter, September 30, in each year to coincide with the fiscal year. That's the best way to accurately determine how spending in each fiscal year contributes to the debt and to compare it to economic growth. Please note: GDP in the years up to 1947 are not available for the third quarter, so year-end figures are used. 1929 $17 16% Market crash. 1930 $16 18% Hoover signed Smoot-Hawley, reducing trade. 1931 $17 22% Dust Bowl drought raged. 1932 $19 33% Hoover raised taxes. 1933 $23 39% FDR's New Deal increased both GDP and debt. 1935 $29 39% Social Security. 1936 $34 40% Tax hikes renewed depression. 1937 $36 39% Third New Deal. 1938 $37 43% Dust Bowl ended. 1939 $40 43% Depression ended. 1940 $43 50% FDR increased spending and raised taxes. 1941 $49 45% U.S. entered WWII. 1942 $72 48% Defense tripled. 1944 $204 91% Bretton Woods. 1945 $260 114% WWII ended. 1946 $271 119% Truman's 1st term budgets. Recession. 1947 $257 104% Cold War. 1950 $257 89% Korean War boosted growth and debt. 1953 $266 68% Recession when war ended. 1954 $271 70% Eisenhower's budgets. Recession. 1958 $276 58% Eisenhower's 2nd term. Recession. 1959 $285 54% Fed raised rates. 1961 $289 52% Bay of Pigs. 1962 $298 49% JFK budgets. Cuban missile crisis. 1963 $306 48% U.S. aids Vietnam. JFK killed. 1964 $312 46% LBJ's budgets. War on poverty. 1965 $317 43% U.S. entered Vietnam War. 1968 $348 37% Moon landing. 1969 $354 35% Nixon took office. 1971 $398 34% Wage-price controls. 1973 $458 32% Nixon ended gold standard. OPEC oil embargo. 1974 $475 31% Watergate. Budget process created. 1975 $533 32% Vietnam War ended. 1978 $772 32% Carter budgets. Recession. 1980 $908 32% Volcker raised rate to 20%. 1981 $998 31% Reagan tax cut. 1982 $1,142 34% Reagan increased spending. 1983 $1,377 37% Jobless rate 10.8%. 1984 $1,572 38% Increased defense spending. 1986 $2,125 46% Reagan lowered taxed. S&L Crisis. 1988 $2,602 49% Fed raised rates. 1989 $2,857 50% Bush 41 budgets. S&L Crisis. 1990 $3,233 54% Desert Storm. 1994 $4,693 64% Clinton budgets. 1996 $5,225 64% Welfare reform. 1998 $5,526 61% LTCM crisis. Recession. 1999 $5,656 58% Glass-Steagall repealed. 2000 $5,674 55% Budget surplus. 2001 $5,807 55% 9/11 attacks. EGTRRA. 2003 $6,783 59% JGTRRA. Iraq War. 2004 $7,379 60% Iraq War. 2005 $7,933 60% Bankruptcy Act. Katrina. 2006 $8,507 61% Bernanke chaired Fed. 2007 $9,008 62% Bank crisis. 2008 $10,025 68% Bank bailout. QE. 2009 $11,910 ($11,000 on Mar 16 and $12,000 on Nov 16) 83% Bank bailout cost $250 b. ARRA added $241.9 b. 2011 $14,790 ($15,000 on Nov 15) 95% Debt crisis. Recession and tax cuts reduced revenue. 2013 $16,738 ($17,000 on Oct 17) 99% Sequester, Government shutdown. 2014 $17,824 ($18,000 on Dec 15) 101% War cost $309 billion. QE ended. Debt ceiling crisis. 2015 $18,151 99% Defense = $736.4 b. 2016 $19,573 ($19,000 on Jan 29) 104% Defense = $767.6 b. 2017 $20,245 ($20,000 on Sep 8) 103% Congress raised debt ceiling. 2018 $21,516 ($21,000 on Mar 15) 105% Trump tax cuts. 2019 $22,776 ($22,000 on February 11) 106% Defense = $956.5 b. 2020 $24,057 (est.) 106% Defense = record $989 b. Debt from 1929 to 2018: U.S. Treasury Historical Tables and U.S. Treasury, Debt to the Penny. Debt from 2019 to 2021: FY 2020 budget, Tables S-9, Economic Assumptions and S-10. Federal Government Financing and Debt.